*From Palestine to Mexico, all the walls have got to go! As we gather here today, more than 1,500 Palestinian political prisoners are in their 15th day of a hunger strike against conditions that Amnesty International calls “unlawful and cruel.” Their action is part of a long international tradition, including the hunger strike held last fall by prisoners in the United States. But the Israeli government — which receives $3.8b/year in U.S. weapons, and closely coordinates with the NYPD and other police agencies that systematically target Black and Brown communities in this country — has branded the strikers “terrorists,” just as the South African apartheid regime once labeled Nelson Mandela and thousands of other political prisoners. Despite all this, unjust and oppressive regimes — no matter how powerful they may appear — always fall: Jim Crow fell, South African apartheid fell, Zionism will fall. I am proud to say that a growing number of workers in the United States are joining them in to stand against the apartheid regime. Since 2014 alone, West Coast longshore workers have refused to handle Israeli Zim Line cargo; UAW 2865, 2322, and GSOC-2110; the United Electrical Workers, CT State AFL-CIO, and AFT 3220 have endorsed the Palestinian-led Boycott, Divestment and Sanctions (BDS) picket line, which demands an end to Israeli military occupation of the 1967 territories; full equality for Palestinian citizens of Israel; and the right of return for Palestinian refugees. These actions are in the highest tradition of solidarity, from Black Lives to Standing Rock, from New York City to Palestine. 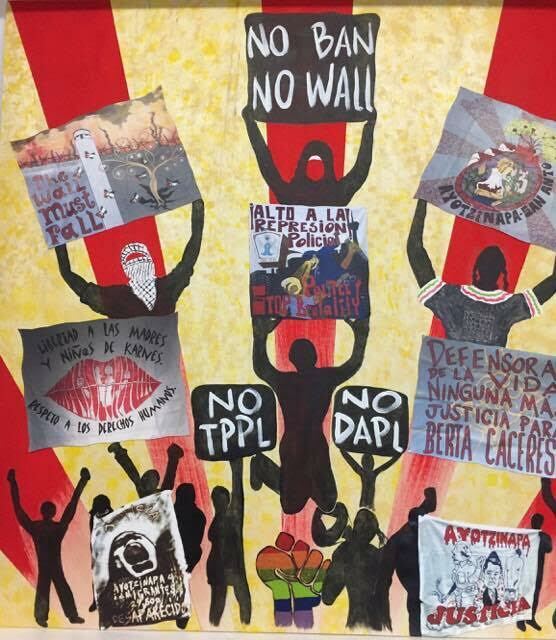 This entry was posted in BDS, Labor for Standing Rock, LFP Statements, Political Prisoners, U.S. Labor News. Bookmark the permalink.